For several years, a group of Limassol based ladies “The Crafty Ladies” have met regularly to share their craft skills and to plan a twice yearly Craft Fair which they organise to support local charities. They have so far managed to raise many thousands of euros for mostly Limassol based organisations, and this year their efforts will go to support the Wellspring Association from Limassol. 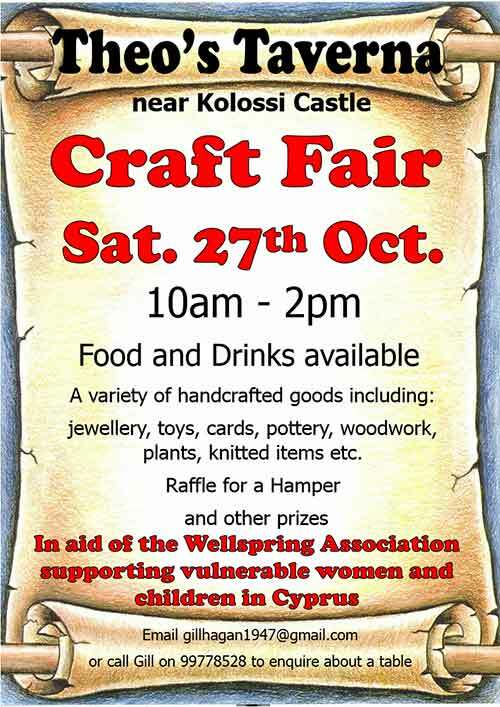 The next Craft Fair will be at Theo’s Taverna opposite Kolossi Castle on Saturday October 27th from 10am – 2pm. Wellspring offer support and practical assistance to vulnerable women who may have been trafficked, exploited or who are in abusive relationships etc. This charity desperately needs funds to carry on their work and is reliant on donations from individuals, organisations and churches so that their volunteers can offer whatever is necessary to support these women. Wellspring has a charity shop at 194 St. Andrew’s Street. Their “Right Here Boutique” sells high quality second hand goods of all kinds to raise funds.